Suarez is a self-publishing success story. His self published near future techno-thriller caught the eye of a Wired writer and was recommended throughout the tech community where it was met with high praise and extreme interest. Daemon introduced a powerful computer program determined to implement an new world order. In this follow up, the corporations and governments fight back, trying to hold onto their power through any means possible. Suarez knows his stuff and his unique vision of an near future AI power struggle is one worth reading. Haldeman has been very hit or miss for me. The Forever War is a timeless classic. Cameoflague is terrible drek and I have no clue how it managed to win the Nebula. Starbound is the follow up to last year's Marsbound and details escalating conflict between humans and The Others, an alien race as strange as they are powerful. Haldeman can do Hard SF so I'm looking forward to this one. The last book in Kay Kenyon's Entire and the Rose series. I haven't read the summary to avoid spoilers but I'm going to be reading the entire series in January. I've heard a lot of good things about this series. Plus it's being published by Pyr, who know how to pick them. And the covers...I would read the phone book if it had a cover like that. Timothy Zahn's 4th (and I believe final) book in his Frank Compton Novels. Zahn is severely underrated and I'm not sure why. I loved his Star Wars books and his Conquerer's Trilogy is space opera at it's best. Not to mention the fact that Avatar might have ripped off his Manta's Gift in more ways than one. If you like pulp sci-fi with aliens and adventure, I'd suggest giving the Compton novels a try. This is the Star Wars book I've been waiting for. Tight plotting, original characters (that could possibly die unlike Luke/Leia/Han) and spectacularly well written action sequences. Crosscurrent also features a higher level of prose quality that the typical Star Wars adventure. Think Empire Strikes Back not The Phantom Menace. You can read my full review here. This is the PB release of the latest of Allen Steele's Coyote books. The first few books in the Coyote series are underrated SFF classics and I'll be interested to see if Steele continues the quality with this follow-up. Book 9 of the Malazan Books of the Fallen. I haven't actually read any of them to date but I know a lot of SFFers who do and they all seem to be very high on these books. This is Book 9 of 10 and as far as I understand it, the depth and breadth of Erikson's worldbuilding is almost unparalleled. 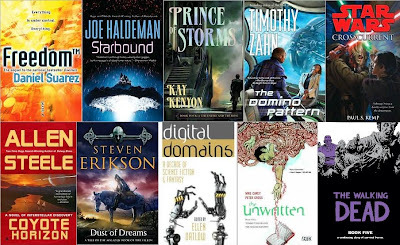 Ellen Datlow collects some of the best fiction from the last ten years of Webzines/Webfiction including Omni Online, Event Horizon, and SciFiction. I'm always interested in finding good fiction online but I don't know how to separate the quality from the crap. That's what editors are for! Mike Carey's Felix Castor novel's are one of my favorite Urban Fantasy series and although I haven't sampled any of his prior comic work, Unwritten intrigued me. Tom Taylor is the subject of a bestselling fantasy series (think Harry Potter) authored by his father. But his life unravels and he starts to doubt which version of Tom Taylor is the real thing. That metalevel premise sounds very similar to Lev Grossman's The Magicians and is one I'm very interested in reading. Kirkman's The Walking Dead comic is one of the most unpredictable and enthralling series in comics today. Focusing on survival in the wake of a zombie apocalypse, this is anything but a stereotypical zombie story. This is the 5th Hardcover which collects TPBs 9 and 10. If you like zombie survival horror, and aren't reading this series, you are missing out. If you want to read 1 book this month, I'd highlight Paul Kemp's Crosscurrent. I just finished it recently and it's a return to the Star Wars of the original trilogy with none of the Prequel nonsense. Tight plot, well written action. If you read Star Wars it's a must read for you. If you don't but are interesting in trying, Crosscurrent is about as stand-alone as you are going to find in the expanded universe these days. Anyway, as always, if you are interested in more details regarding any of the above books, just click on through the Amazon links. I'm more interested in telling you why I recommended them rather than simply what the books are about. out there. Anything that might have escaped my genre nets? Which one of these covers is your favorite? @Marduk - Thanks for the note. I had no intention on starting with Book 9. I just happen to know that a lot of people are recommending Malazan so if you are reading the series it's a book you are going to be interested in. ahh cool. Now get into them, you won't regret it!